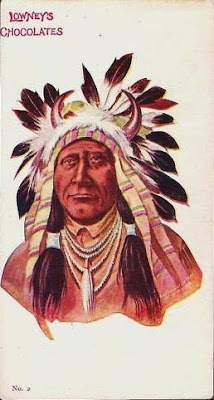 Depictions of Native Americans otherwise known as "Indians" have been used to sell food products for many years. I grew up with the beautiful Land 'O Lakes Butter's squatting squaw and the Calumet Baking Powder chief in our pantry. A native woman was also used in early corn product advertisements for Mazola Corn Oil. When researching candy history I have come across many maple syrup stories and recipes. It is American Indians who discovered that gently cooking maple sap produces a sweet syrup and cooking a little longer makes portable candy treats and a storable sugar. Indians traded their maple sugar with early settlers and eventually taught them the secrets of the maple sugaring process.